Count Basie studied drums as a youngster before concentrating on piano, which undoubtedly influenced his extraordinary rhythmic sense. Band members joked that he could put rhythm into a single note. Basie was playing in vaudeville when, in 1928, he was stranded in <?xml:namespace prefix = st1 />Kansas City where he joined bassist Walter Page’s famous Blue Devils. There is a marvelous documentary of these years which is now available on video though hard to find, The Last of the Blue Devils. Early recordings with Benny Moten’s band show that Basie was an accomplished pianist in the stride tradition. But with Page he pared down his playing to skeletal style, simplified the beat, and added drummer Jo Jones, who favored cymbals over the heavy bass drum. In 1935 Basie brought his Barons of Rhythm to the Reno Club in Kansas City and soon added guitarist Freddie Green to create an innovative four-man rhythm section. 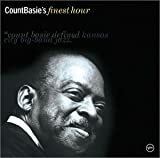 The Basie band depended on “head” arrangements, riffs created spontaneously on the bandstand (which is how “One O’Clock Jump” originated), and soloists like tenor saxophonists Lester Young and Hershel Evans. By 1939 the Count Basie Orchestra, featuring blues shouter Jimmy Rushing, became larger and personnel changed. Basie began to depend more on charts written by band members. In the early ‘50s, as big bands lost favor, Basie created a smaller ensemble. But in 1952 he put together a new big band, hired Neal Hefti as arranger, and made the orchestra, not the soloists, the focal point. Vocalist Joe Williams also became an integral part of the band. The orchestra, still noted for its irrepressible swing, won four Grammys, made world tours, and was in great demand by jazz instrumentalists and singers. Basie kept his band together longer than anyone except Duke Ellington. After his death in 1984 the orchestra continued under the leadership of Thad Jones and then Frank Foster, who kept it swinging from 1986 until 1995. Basie is credited with almost 300 compositions, including “Blue and Sentimental” (with Mack David and Jerry Livingston), “Taxi War Dance” (written with Lester Young and based on the changes of “Willow Weep for Me”), “Jumpin’ at the Woodside” (lyrics by Jon Hendricks), and “Harvard Blues” (lyrics by George Frazier). Bassist Ray Brown wrote “Captain Bill” for Basie who liked to wear a yachtsman’s cap.